Bernoulli's principle is a concept of fluid dynamics. It says that when an incompressible flow of an ideal fluid moves through different sizes of tube, the fluid's speed changes. This change in velocity is called "acceleration". Newton showed that acceleration only occurs through the action of a force. When a force acts over an area, it is called "pressure". A higher pressure pushes (accelerates) fluid toward lower pressure. So any change in a fluid's speed must be matched by a change in pressure (force). Bernoulli saw that while the fluid moved more quickly in the smaller part of the tube, the pressure became less. Please note that this refers to changes in speed and pressure along a single path of flow and does not apply to two different flows at different speeds. Basically, the Bernoulli principle says that as speed of the fluid increases, pressure decreases. The photo on the right shows this happening. The air in the wide part of the tube has a higher static pressure than the thin part. 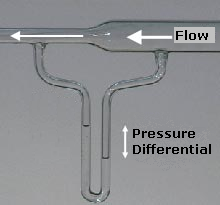 For a steady flow, the amount of fluid entering the pipe must equal the amount leaving the pipe, so the fluid speed in the thin part must increase. This page was last changed on 20 April 2019, at 06:59.